Teaching and Learning with Technology (TLT) and Adobe invite students and faculty to participate in an exciting exploration of photography and image editing techniques hosted by Adobe’s Principal Evangelist for Digital Imaging, Julieanne Kost. Kost will be teaching workshop sessions on September 19 and 20 between 9:00 a.m. and 5:30 p.m. at Hintz Family Alumni Center. Online registration for the event is currently open, and there is no cost for Penn State students and faculty to attend. Pre-registration is required. There will be a variety of sessions covering different topics, and attendees can register for the entire two-day event or solely the sessions that fit their schedule. Participants will need to bring a smartphone with a built-in camera, or a digital camera. For the photo editing sessions, a laptop with Adobe Lightroom and Adobe Photoshop will be necessary. 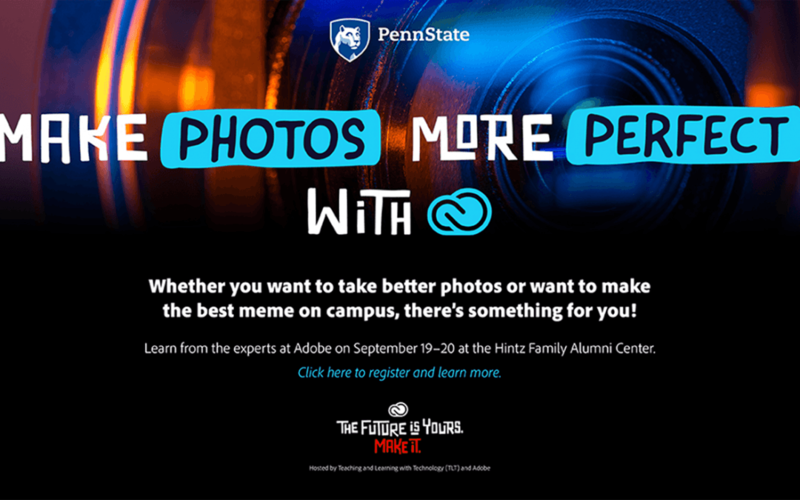 Penn State students and faculty have free access to a fully-featured Adobe Creative Cloud account. Representatives from TLT will be at the HUB on Wednesday, September 12 to assist any students or faculty members set up their free Adobe Creative Cloud accounts. Instruction at the workshop sessions will be provided by Kost, an expert in digital photography and editing with Creative Cloud tools. She has presented at training sessions and tutorials around the world. She has won awards from the Professional Photographers of America, the American Society of Photographers, and is a member of the Photoshop Hall of Fame.